Add a touch of natural whimsy to your home with this intriguing geometric watercolor. The aspens of Maker Renee Leone's vibrant watercolor draw the eye to the highest peaks of the grand Rockies in the distance, while a patchwork of the winding river's colorful shore and the icy mountaintops give this piece of art a whimsical feel. 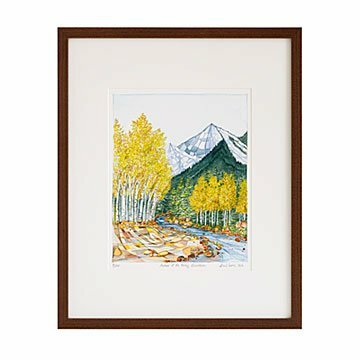 Complemented with a java-finished poplar frame, the unique geometric style of this piece of art brings a modern vibe to classic landscape paintings. Renee creates a visual travel journal of iconic natural sceneries, which are hand signed and numbered prints in a limited edition of 250. Print made in Chicago. Frame made in the USA. Check out Renee Leone's other Regional Tree prints: Desert Cacti of the Southwest, Redwoods of the West Coast, Maples of the North Atlantic and Birches of New England. Renée Leone's vibrant geographic watercolor paintings offer entrancing vistas as seen through the artist's eyes and felt through her heart. Part visual travel journal, part diary, her collection of images represent chapters of the Chicago-based painter's life, culminating in an artistic journal depicting the places she has been and the experiences she has encountered along the way. She combines her affinity for the geometric patterning used in textiles, mosaics, and stained glass to create personal home, nature, and building portraits that depict not only what she saw in a particular location, but, more significantly, what she felt. The stained hardwood frame is poplar wood; the black frame is BonanzaWood®. Both frames are made in America. The unframed option is not matted. I plan to hang it on our wall in the family room. It is outstanding to look at and I know my friends will enjoy it too. I want more pictures from her. I got this and the others framed and they all look fabulous in my library. Love them!